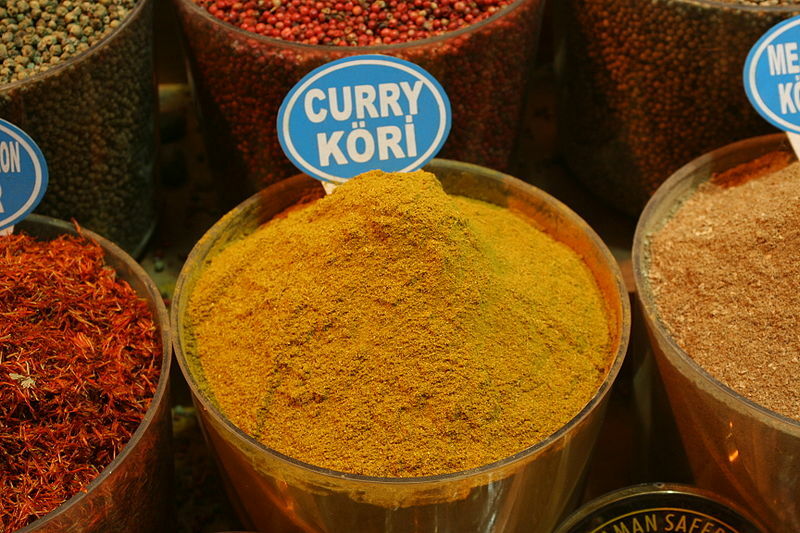 Curry is a generic description used throughout European and American culture to describe a general variety of spiced dishes, best known in Indian cuisines, especially South Asian cuisine. In most South Indian languages, the word curry literally means 'side-dish', which can be eaten along with a main dish like rice or bread. 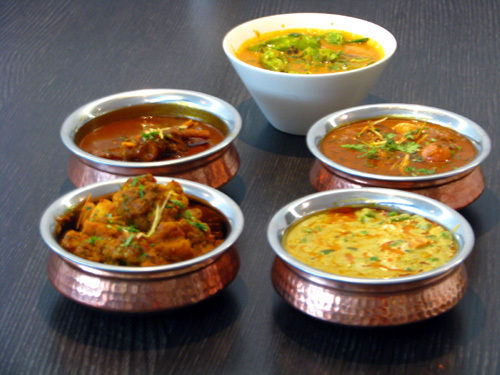 Left: A variety of vegetable curries from India. Curry is a generic term, and although there is no one specific attribute that marks a dish as "curry", some distinctive spices used in many, though certainly not all, curry dishes include turmeric, cumin, coriander, fenugreek, and red pepper. Curry's popularity in recent decades has spread outward from the Indian subcontinent to figure prominently in international cuisine. Consequently, each culture has adopted spices in their indigenous cooking, to suit their own unique tastes and cultural sensibilities. Curry can therefore be called a pan-Asian or global phenomenon, with immense popularity in Thai, British and Japanese cuisines. In British cuisine, the word "curry" is primarily used to denote a sauce-based dish flavoured with curry powder or a paste made from the powder and oils. However, the use of fresh spices such as ginger and garlic, and preparation of an initial masala from freshly ground dried spices are sometimes used. The popularity of curry among the general public was enhanced by the invention of "Coronation chicken" to commemorate the coronation of Queen Elizabeth II in 1953. Curry sauce (or curry gravy) is a British use of curry as a condiment, usually served warm with traditional British fast food dishes such as chips. Curry sauce occasionally would include sultanas. In a relatively short space of time curry has become an integral part of British cuisine, so much so that, since the late 1990s, Chicken Tikka Masala has been referred to as "a true British national dish".